Trail, track or road. 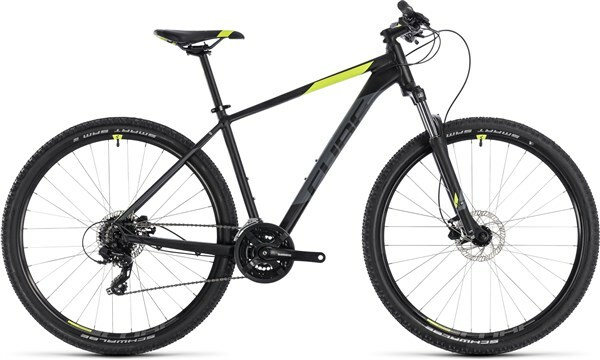 The Cube Aim Pro 29er is a versatile hardtail mountain bike for aspiring trail warriors who want a bike to ride everywhere. Offering 100mm of suspension travel to smooth the bumps on the trail is the SR Suntour XCT suspension fork. Hydraulic disc brakes give you consistent stopping power for confident descending in all weather conditions. The Shimano 3x8 speed drivetrain offers reliable shifting with a wide range of gears for taking on all the climbs on the mountain. The 29” wheels offer the fastest rolling performance on all types of terrain although smaller riders will prefer the fit of the Cube Aim Pro 27.5.